The earliest animals were marine invertebrates, that is, vertebrates came later. Animals are multicellular eukaryotes,[note 1] and are distinguished from plants, algae, and fungi by lacking cell walls. Marine invertebrates are animals that inhabit a marine environment apart from the vertebrate members of the chordate phylum; invertebrates lack a vertebral column. Some have evolved a shell or a hard exoskeleton. The earliest animals may belong to the genus Dickinsonia, 571 million to 541 million years ago. Individual Dickinsonia typically resemble a bilaterally symmetrical ribbed oval. They kept growing until they were covered with sediment or otherwise killed, and spent most of their lives with their bodies firmly anchored to the sediment. Their taxonomic affinities are presently unknown, but their mode of growth is consistent with a bilaterian affinity. Historically body plans were thought of as having evolved in rapidly during the Cambrian explosion, but a more nuanced understanding of animal evolution suggests a gradual development of body plans throughout the early Palaeozoic and beyond. More generally a phylum can be defined in two ways: as described above, as a group of organisms with a certain degree of morphological or developmental similarity (the phenetic definition), or a group of organisms with a certain degree of evolutionary relatedness (the phylogenetic definition). Xiphosura, includes a large number of extinct lineages and only four recent species in the family Limulidae, which include the horseshoe crabs. Sponges are animals of the phylum Porifera (Modern Latin for bearing pores ). They are multicellular organisms that have bodies full of pores and channels allowing water to circulate through them, consisting of jelly-like mesohyl sandwiched between two thin layers of cells. They have unspecialized cells that can transform into other types and that often migrate between the main cell layers and the mesohyl in the process. Sponges do not have nervous, digestive or circulatory systems. Instead, most rely on maintaining a constant water flow through their bodies to obtain food and oxygen and to remove wastes. Arrow worms are predatory components of plankton worldwide. Worms (Old English for serpent) typically have long cylindrical tube-like bodies and no limbs. Marine worms vary in size from microscopic to over 1 metre (3.3 ft) in length for some marine polychaete worms (bristle worms) and up to 58 metres (190 ft) for the marine nemertean worm (bootlace worm). Some marine worms occupy a small variety of parasitic niches, living inside the bodies of other animals, while others live more freely in the marine environment or by burrowing underground. Lamellibrachia luymes, a cold seep tubeworm, lives over 250 years. The echinoderms are important both biologically and geologically. Biologically, there are few other groupings so abundant in the biotic desert of the deep sea, as well as shallower oceans. Most echinoderms are able to regenerate tissue, organs, limbs, and reproduce asexually; in some cases, they can undergo complete regeneration from a single limb. Geologically, the value of echinoderms is in their ossified skeletons, which are major contributors to many limestone formations, and can provide valuable clues as to the geological environment. They were the most used species in regenerative research in the 19th and 20th centuries. Further, it is held by some scientists that the radiation of echinoderms was responsible for the Mesozoic Marine Revolution. Aside from the hard-to-classify Arkarua (a Precambrian animal with echinoderm-like pentamerous radial symmetry), the first definitive members of the phylum appeared near the start of the Cambrian. Molluscs (Latin for soft) form a phylum with about 85,000 extant recognized species. By species count they are the largest marine phylum, comprising about 23% of all the named marine organisms. Molluscs have more varied forms than other invertebrate phylums. They are highly diverse, not just in size and in anatomical structure, but also in behaviour and in habitat. The majority of species still live in the oceans, from the seashores to the abyssal zone, but some form a significant part of the freshwater fauna and the terrestrial ecosystems. The mollusc phylum is divided into 9 or 10 taxonomic classes, two of which are extinct. These classes include gastropods, bivalves and cephalopods, as well as other lesser-known but distinctive classes. Gastropods with protective shells are referred to as snails (sea snails), whereas gastropods without protective shells are referred to as slugs (sea slugs). Gastropods are by far the most numerous molluscs in terms of classified species, accounting for 80% of the total. Bivalves include clams, oysters, cockles, mussels, scallops, and numerous other families. There are about 8,000 marine bivalves species (including brackish water and estuarine species), and about 1,200 freshwater species. Cephalopod include octopus, squid and cuttlefish. 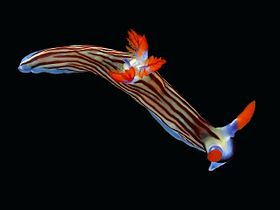 They are found in all oceans, and neurologically are the most advanced of the invertebrates. About 800 living species of marine cephalopods have been identified, and an estimated 11,000 extinct taxa have been described. There are no fully freshwater cephalopods. Marine arthropods range in size from the microscopic crustacean Stygotantulus to the Japanese spider crab. 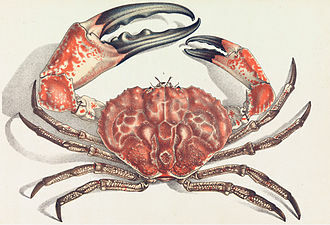 Arthropods' primary internal cavity is a hemocoel, which accommodates their internal organs, and through which their haemolymph - analogue of blood - circulates; they have open circulatory systems. Like their exteriors, the internal organs of arthropods are generally built of repeated segments. Their nervous system is "ladder-like", with paired ventral nerve cords running through all segments and forming paired ganglia in each segment. Their heads are formed by fusion of varying numbers of segments, and their brains are formed by fusion of the ganglia of these segments and encircle the esophagus. The respiratory and excretory systems of arthropods vary, depending as much on their environment as on the subphylum to which they belong. Their vision relies on various combinations of compound eyes and pigment-pit ocelli: in most species the ocelli can only detect the direction from which light is coming, and the compound eyes are the main source of information, but the main eyes of spiders are ocelli that can form images and, in a few cases, can swivel to track prey. Arthropods also have a wide range of chemical and mechanical sensors, mostly based on modifications of the many setae (bristles) that project through their cuticles. Arthropods' methods of reproduction and development are diverse; all terrestrial species use internal fertilization, but this is often by indirect transfer of the sperm via an appendage or the ground, rather than by direct injection. Marine species all lay eggs and use either internal or external fertilization. Arthropod hatchlings vary from miniature adults to grubs that lack jointed limbs and eventually undergo a total metamorphosis to produce the adult form. Trilobites, now extinct, roamed oceans for 270 million years. The banded cleaner shrimp is a crustacean common in the tropics. The Japanese spider crab has the longest leg span of any arthropod. There are a number of marine invertebrates that use minerals that are present in the sea in such minute quantities that they were undetectable until the advent of spectroscopy. Vanadium is concentrated by some tunicates for use in their blood cells to a level ten million times that of the surrounding seawater. Other tunicates similarly concentrate niobium and tantalum. :947 Lobsters use copper in their respiratory pigment hemocyanin, despite the proportion of this metal in seawater being minute. :638 Although these elements are present in vast quantities in the ocean, their extraction by man is not economic. ^ Myxozoa were thought to be an exception, but are now thought to be heavily modified members of the Cnidaria. Jímenez-Guri, Eva; Philippe, Hervé; Okamura, Beth; Holland, Peter W. H. (July 6, 2007). "Buddenbrockia Is a Cnidarian Worm". Science. 317 (5834): 116–118. Bibcode:2007Sci...317..116J. doi:10.1126/science.1142024. ISSN 0036-8075. PMID 17615357. ^ a b Gould, Stephen Jay (1990) Wonderful Life: The Burgess Shale and the Nature of History W. W. Norton. ISBN 9780393307009. ^ Davidson, Michael W. (May 26, 2005). "Animal Cell Structure". Molecular Expressions. Tallahassee, FL: Florida State University. Retrieved 2008-09-03. ^ Vogel, Gretchen (2018-09-20). "This fossil is one of the world's earliest animals, according to fat molecules preserved for a half-billion years". Science. AAAS. Retrieved 21 September 2018. ^ Gold, D. A.; Runnegar, B.; Gehling, J. G.; Jacobs, D. K. (2015). "Ancestral state reconstruction of ontogeny supports a bilaterian affinity for Dickinsonia". Evolution & Development. 17 (6): 315–397. doi:10.1111/ede.12168. ^ Jun-Yuan Chen; Oliveri, Paola; Feng Gao; et al. (August 1, 2002). "Precambrian Animal Life: Probable Developmental and Adult Cnidarian Forms from Southwest China" (PDF). Developmental Biology. 248 (1): 182–196. doi:10.1006/dbio.2002.0714. ISSN 0012-1606. PMID 12142030. Archived from the original (PDF) on May 26, 2013. Retrieved 2015-02-04. ^ Seilacher, Adolf (August 1992). "Vendobionta and Psammocorallia: lost constructions of Precambrian evolution". Journal of the Geological Society. 149 (4): 607–613. Bibcode:1992JGSoc.149..607S. doi:10.1144/gsjgs.149.4.0607. ISSN 0016-7649. Retrieved 2015-02-04. ^ Martin, Mark W.; Grazhdankin, Dmitriy V.; Bowring, Samuel A.; et al. (May 5, 2000). "Age of Neoproterozoic Bilaterian Body and Trace Fossils, White Sea, Russia: Implications for Metazoan Evolution". Science. 288 (5467): 841–845. Bibcode:2000Sci...288..841M. doi:10.1126/science.288.5467.841. ISSN 0036-8075. PMID 10797002. ^ Fedonkin, Mikhail A.; Waggoner, Benjamin M. (August 28, 1997). "The late Precambrian fossil Kimberella is a mollusc-like bilaterian organism". Nature. 388 (6645): 868–871. Bibcode:1997Natur.388..868F. doi:10.1038/42242. ISSN 0028-0836. ^ Mooi, Rich; David, Bruno (December 1998). "Evolution Within a Bizarre Phylum: Homologies of the First Echinoderms" (PDF). American Zoologist. 38 (6): 965–974. doi:10.1093/icb/38.6.965. ISSN 1540-7063. Retrieved 2015-02-05. ^ McMenamin, Mark A. S. (September 2003). Spriggina is a trilobitoid ecdysozoan. Geoscience Horizons Seattle 2003. Abstracts with Programs. 35. Boulder, CO: Geological Society of America. p. 105. OCLC 249088612. Retrieved 2007-11-24. Paper No. 40-2 presented at the Geological Society of America's 2003 Seattle Annual Meeting (November 2–5, 2003) on November 2, 2003, at the Washington State Convention Center. ^ Budd, Graham E. (February 2003). "The Cambrian Fossil Record and the Origin of the Phyla" (PDF). Integrative and Comparative Biology. 43 (1): 157–165. doi:10.1093/icb/43.1.157. ISSN 1557-7023. PMID 21680420. Retrieved 2015-02-06. ^ a b Valentine, James W (2004-06-18). On the Origin of Phyla. ISBN 9780226845487. ^ "Spongia Linnaeus, 1759". World Register of Marine Species. Retrieved July 18, 2012. ^ Rowland, S. M. & Stephens, T. (2001). "Archaeocyatha: A history of phylogenetic interpretation". Journal of Paleontology. 75 (6): 1065–1078. doi:10.1666/0022-3360(2001)075<1065:AAHOPI>2.0.CO;2. JSTOR 1307076. Archived from the original on December 6, 2008. ^ Sperling, E. A.; Pisani, D.; Peterson, K. J. (January 1, 2007). "Poriferan paraphyly and its implications for Precambrian palaeobiology" (PDF). Geological Society, London, Special Publications. 286 (1): 355–368. Bibcode:2007GSLSP.286..355S. doi:10.1144/SP286.25. Archived from the original (PDF) on December 20, 2009. Retrieved August 22, 2012. ^ "Nematostella". Nematostella.org. Retrieved 2014-01-18. ^ "The Persistent Parasites". Time Magazine. 1957-04-08. ^ Hargis, William J. (1985). "Parasitology and pathology of marine organisms of the world ocean". NOAA Tech. Rep.
^ "Classification of Animal Parasites". ^ Garcia, Lynne. "Classification of Human Parasites, Vectors, and Similar Organisms" (PDF). UCLA Medical Center Los Angeles California. ^ "Sea Lily". Science Encyclopedia. Retrieved Sep 5, 2014. ^ Barnes, R.S.K, Calow P, Olive, P.J.W., Golding DW, Spicer JI (2001). The Invertebrates, A Synthesis (3 ed.). UK: Blackwell Science. ^ Black, Richard (April 26, 2008). "Colossal squid out of the freezer". BBC News. ^ Kathryn Phillips (15 June 2008). "Living Fossil Memories". Inside JEB. 211 (12): iii. doi:10.1242/jeb.020370. ^ Robyn Crook & Jennifer Basil (2008). "A biphasic memory curve in the chambered nautilus, Nautilus pompilius L. (Cephalopoda: Nautiloidea)". The Journal of Experimental Biology. 211 (12): 1992–1998. doi:10.1242/jeb.018531. PMID 18515730. ^ a b c d e f Ruppert, Edward E.; Fox, Richard, S.; Barnes, Robert D. (2004). Invertebrate Zoology, 7th edition. Cengage Learning. ISBN 978-81-315-0104-7. ^ Giribet, G.; Okusu, A, A.; Lindgren, A.R., A. R.; Huff, S.W., S. W.; Schrödl, M, M.; Nishiguchi, M.K., M. K. (May 2006). "Evidence for a clade composed of molluscs with serially repeated structures: monoplacophorans are related to chitons". Proceedings of the National Academy of Sciences of the United States of America. 103 (20): 7723–7728. Bibcode:2006PNAS..103.7723G. doi:10.1073/pnas.0602578103. PMC 1472512. PMID 16675549. ^ Healy, J.M. (2001). "The Mollusca". In Anderson, D.T. (ed.). Invertebrate Zoology (2 ed.). Oxford University Press. pp. 120–171. ISBN 978-0-19-551368-4. ^ Work, Yes We. "Learn more about First Life - David Attenborough's First Life". Archived from the original on 2011-01-26. ^ Carson, Rachel (1997). The Sea Around Us. Oxford Paperbacks. pp. 190–191. ISBN 978-0195069976.